One million sales mean Capcom is likely to turn Dragon's Dogma into a full-blown franchise. Despite underwhelming sales in the west, Dragon's Dogma's strong performance in Japan helped Capcom shift an impressive 1 million units. The title's success means Capcom's plans to turn it into a "major franchise" are likely to go ahead. During a conference call with investors, the company stated that it's in a position to "favorably consider subsequent titles." 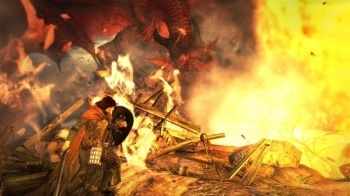 Previously, director Hideaki Itsuno said that Dragon's Dogma 2 would happen only if fans "wanted it badly enough." Dragon's Dogma is at least partially responsible for Capcom's highly successful last quarter. The company announced a 290.2 percent jump in profits during the three-month period ending on June 30th. That's despite the fact Capcom, along with many other Japanese publishers, took a huge revenue hit when the government began cracking down on the "complete gacha" gameplay mechanics often seen in online games. Dragon's Dogma was generally well-received by critics; our own Greg Tito gave it a respectable 3.5/5.